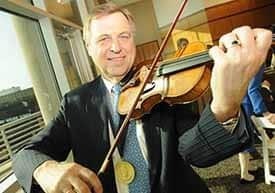 Vladimir Zharov, Ph.D., D.Sc., once an aspiring musician, is also director of the Phillips Classic Laser and Nanomedicine Laboratories at UAMS. Created by the late Josephine McGill, of Camden, UAMS researcher Vladimir Zharov, Ph.D., was invested with the McGill Family Otolaryngology Research Endowment Fund. 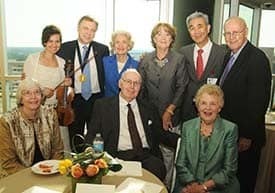 Pictured are (seated left to right) Mary Wetterau, Thomas McGill and Mary Todd Young, (standing left to right) Oksana Pavilionis, Zharov, Sue Williamson, Karen and James Suen, M.D., and Rev. Bill Young. July 2, 2013 | A world-renowned laser and nanomedicine researcher at the University of Arkansas for Medical Sciences (UAMS) is the inaugural recipient of the Josephine T. McGill Chair in Head and Neck Cancer Research. The McGill Family Otolaryngology Research Endowment Fund for head and neck cancer research was created by the late Josephine Tate McGill, of Camden, and her siblings (Mary Helen, Samuel and Thomas) in memory of their parents Samuel D. McGill, M.D., and Helen McRae Watts McGill. The family’s connection with UAMS started many years ago when Helen McRae Watts McGill was a patient under the care of James Suen, M.D., professor and chairman of the Department of Otolaryngology – Head and Neck Surgery in the College of Medicine at UAMS. Vladimir Zharov, Ph.D., D.Sc., senior scientist in the UAMS Winthrop P. Rockefeller Cancer Institute, director of the Phillips Classic Laser and Nanomedicine Laboratory and professor in the UAMS College of Medicine, accepted the chair during a June 4 ceremony at UAMS. Zharov is currently pioneering research in identifying circulating tumor cells in the blood vessels of cancer patients, which will have a major impact on future cancer diagnosis, treatment and follow-up. Suen presented the chair to Zharov and praised his groundbreaking research. Dodie, as she was known, graduated from Camden High School, and then attended the University of Arkansas, Fayetteville, where she was a member of the Chi Omega Sorority. She graduated in 1950 with a degree in home economics and began her career as a home service advisor for Arkansas Power & Light Co (AP&L). After a few years with AP&L, she returned to college to become a dietitian. In 1955, she went to work at Baylor Hospital in Dallas. She also worked in the Dallas area as a dietitian for the Carrollton Independent School District. She later returned to Arkansas as a dietitian for the North Little Rock schools and then the State Health Department.